The holidays are officially upon us and with them come the need for new outfits! We have to look good for all the fun events that come up this time of year, right?! 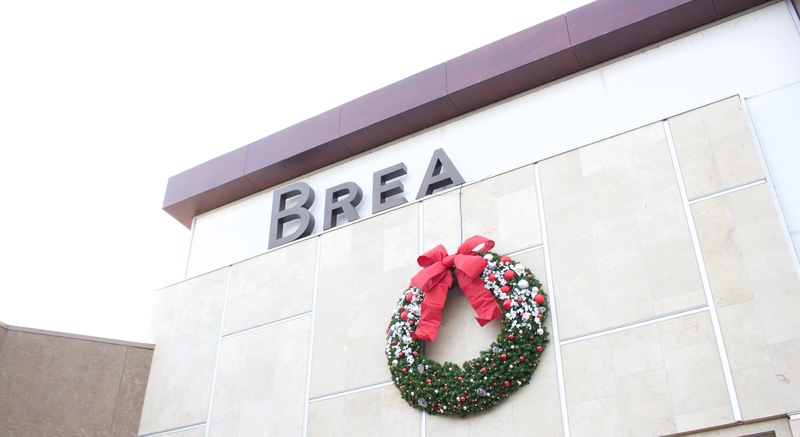 That’s why today I’m excited to announce that I’ve team up with the Brea Mall to share three holiday outfit ideas! I’m also talking about one of my favorite places to grab lunch at the mall because what’s a day of shopping without getting a bite to eat!? I’ve said it before and I’ll say it again. Every time I visit Brea Mall I am equally as amazed as the last! With there being so many clothing retailers to choose from, I know you will find the perfect holiday outfits for every occasion this season! For some inspiration, keep reading! Whether you’re looking for an outfit for a party, gift exchange, or a holiday dinner, I’ve got you covered! If you need a dress for a holiday party with friends or for work, you need to check out the Daisy Shoppe at Brea Mall! When I first saw this red dress in the store, it was love at first sight. I really like the long sleeves and the ruched detail on the front. It’s such a flattering dress and while simple, it makes a statement! To pull the outfit together, I chose a beautiful statement necklace and pavé bracelet, also from the Daisy Shoppe, because what’s a holiday outfit without a little bling? Just add some simple black heels and you’re good to go! During the holiday season, I usually attend at least one gift exchange. I view this as yet another opportunity to wear a cute outfit. Let’s be real…I’m bound to want to take photos with family and friends and I want to look good in the photos. I’m sure you feel the same! I believe that an occasion like this requires an outfit that’s both cozy and casual. For this look, I paired black skinny jeans with a simple cotton tee. Then to make it more holiday appropriate, I added an oversized gray cardigan and the cutest plaid scarf, all from Urban Outfitters at Brea Mall. To complete the look, I chose a black crossbody from Urban Outfitters and the cutest tortoise sunglasses from Quay Australia, which just happens to have a store at Brea Mall as well! Also, I think this outfit would be perfect to wear to the tree lot if your family gets a Christmas tree! Holiday dinners come up frequently this time of year and they too require the perfect outfit. I’ve found that these dinners usually call for an “in between” type of look. By this, I mean that you don’t want your outfit to be casual, but you also don’t want it to be too dressy. This all-black look is the perfect solution! I paired a black velvet dress from the Daisy Shoppe with a rose gold necklace and rose gold bracelets. Then I added some over-the-knee boots. To pull it all together, I chose a round crossbody purse from Urban Outfitters and oversized sunglasses from Quay Australia! If you haven’t tried wearing a monochromatic look, now is the time! And, what’s a trip to the Brea Mall without stopping at Nordstrom Cafe! 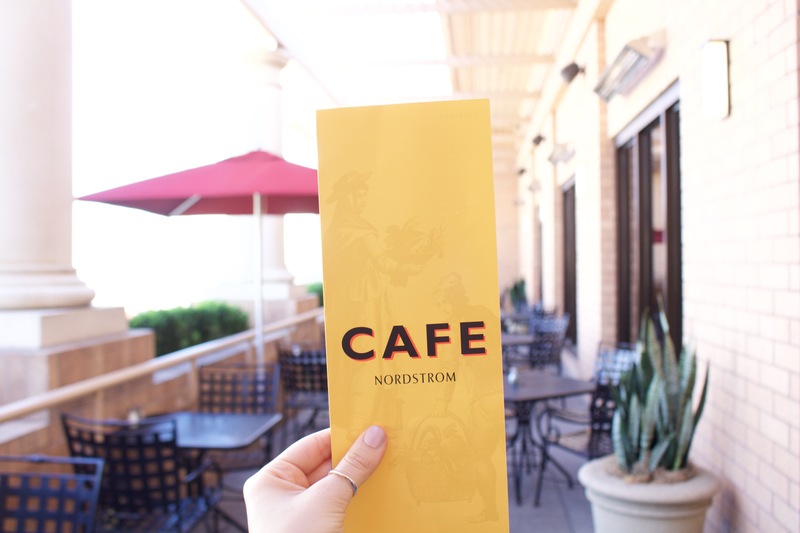 I’ve been dining at Nordstrom Cafe since I was a kid, but what I love about the location at Brea Mall is the outdoor patio! It’s a great place to get some fresh air and take a break from shopping while eating lunch! 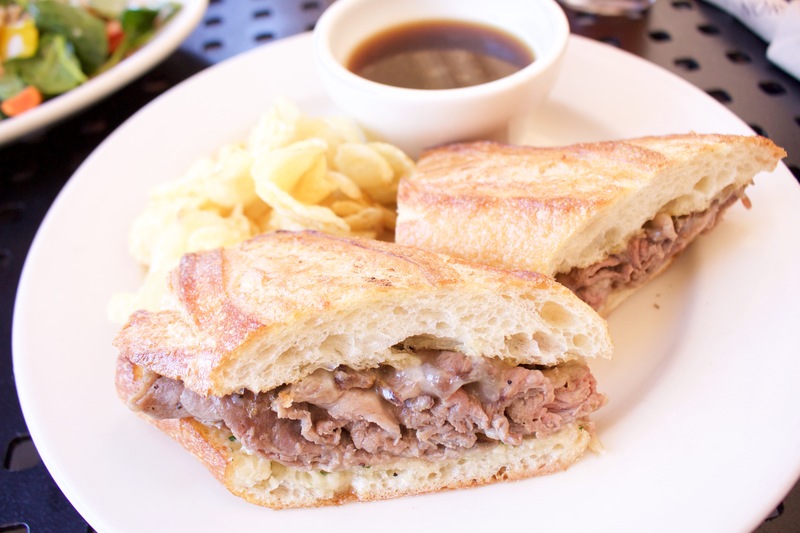 I had to opportunity to try quite a few menu items while at Nordstrom Cafe and everything I tried was so delicious! After having a bite of some of my year round favorites including the Roma Tomato Basil Soup, Fresh Berry & Fig Salad, and Margherita Pizza, it was on to the more seasonal items! 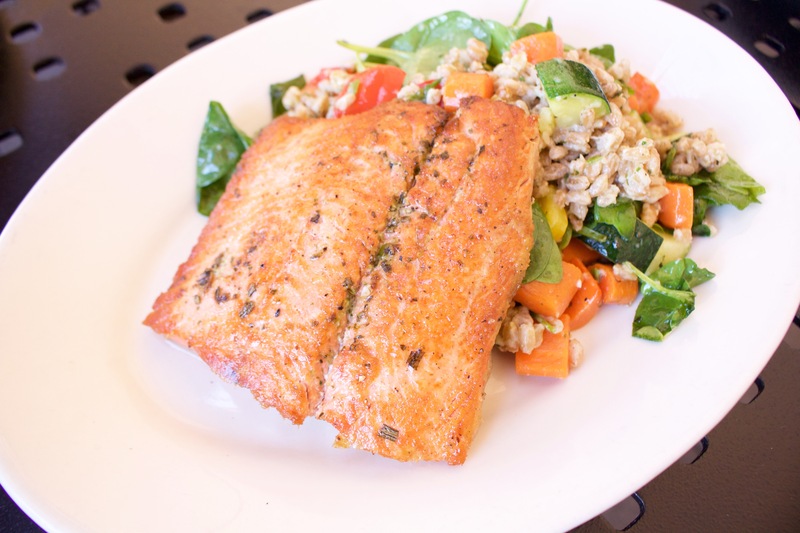 These included the Wild Salmon with Roasted Vegetables & Farro, Herb Chicken with Roasted Vegetables & Farro, Chicken, Apple & Goat Cheese Salad, and French Dip. While everything was amazing, I think my favorite was the Herb Chicken. It had such great flavor and I’m already planning a return trip to the mall just to order it! I can’t say that I’m surprised with how yummy the food was because this Nordstrom Cafe always serves great food and the service is top-notch. Jamie, the manager, is so sweet and my server provided excellent service as well. I’ll definitely be coming back when I head to the mall to do some more holiday shopping. All I can say is that if you were debating about going to the mall this year to get some shopping done or to pick out a new outfit, I highly recommend visiting the Brea Mall. I’ve listed the address below for those interested! Also, on Instagram I’m doing a giveaway for a $50 gift card to the mall. Comment “Done” on my Instagram photo that announces the giveaway. Details: The giveaway runs from tonight until Tuesday, December 5 at midnight PST and winner must be able to pick up the gift card at Brea Mall. * Brought to you by Simon Malls. As always, all opinions are my own. Thank you to all the brands that make My Styled Life possible.